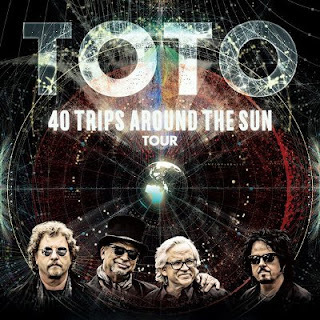 Home / -Touring- / Toto / Touring / Touring: Toto Adds First North American Dates For Their "40 Trips Around the Sun Tour"
Touring: Toto Adds First North American Dates For Their "40 Trips Around the Sun Tour"
Toto are currently touring Europe promoting their brand new career compilation 40 Trips Around the Sun and, on Monday (February 26) added the first thirteen dates for North American shows. The new dates open up on July 30 in Vancouver and run through August 21 in Kansas City. The band promises that more dates will be announced in the near future. The tour presents some of the band's greatest hits along with deeper cuts. For a preview of the music being played, see our Set List article from the opening show of the tour. Steve Lukather said "Myself, David, Steve and Joseph are humbled and thrilled at the long lasting success of the band. This 40th Anniversary tour is going to be a special one for us and all of the fans that come out. On top of all that, it’s really exciting to be working with SONY again. We’ve spent a lot of time last year working on new music and re-mastering the older tracks."